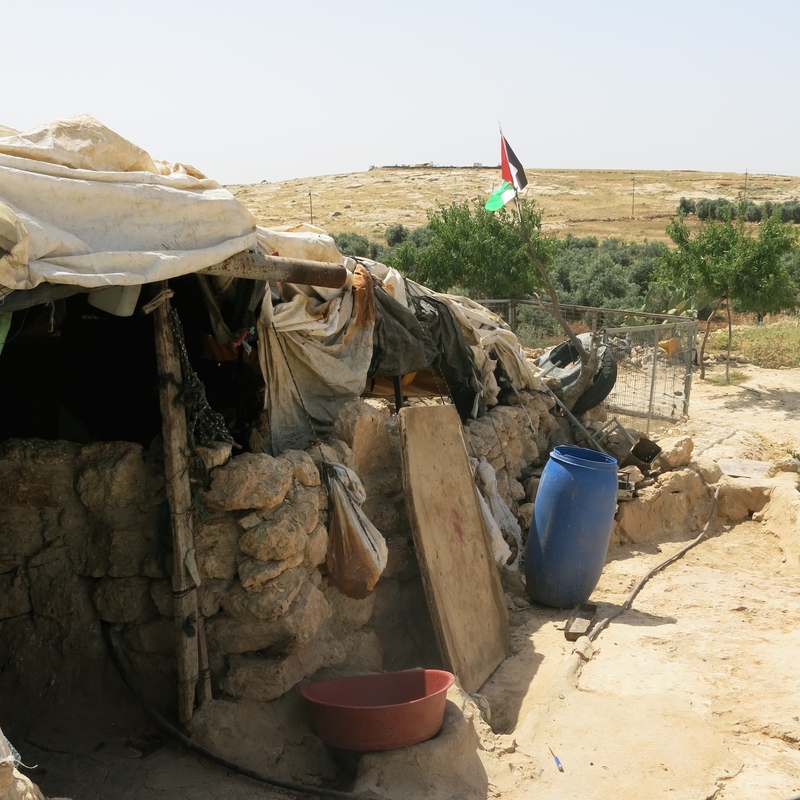 A small collection of shelters in the sweltering heat of the south Hebron hills, the village of Khirbet Susiya has barely enough electricity to power a fan, yet it has become a major Israeli-Palestinian flashpoint. In recent weeks it has hosted a steady stream of visitors – even establishing a small “solidarity” centre offering tea and flyers titled “Save Susiya” in Arabic and Hebrew. Activists from various groups – including left-wing Israelis – stop by to offer support. For Susiya is set to become the latest Palestinian village to be destroyed by Israel after a court ruling. Residents like Nasser Nawaja, the village’s unofficial spokesperson, are wondering if and when the bulldozers will arrive. “I think the state wants to demolish us,” he says. The position of the 350 residents here is emblematic of the Catch-22 situation facing many Palestinians in this part of the West Bank. To avoid their homes being destroyed, the villagers need a state-approved plan or building permit. But, for Palestinians at least, such permits are nigh on impossible to get. According to the Israeli group Bimkom – Planners for Human Rights, between 2002 and 2012, out of 3,565 Palestinian applications for building permits just 210 were approved. With the success rate so low, many feel discouraged and applications are on the downturn. There are no available statistics about illegal Palestinian building. For a rough contrast, Peace Now reports that in the same period more than 17,000 residential units were build in Jewish settlements, with or without permits. Susiya has applied both for multiple permits to build and for recognition from Israel's Civil Administration. Both were denied, leaving it among the roughly 90 percent of Palestinian villages in this area without formal government permission to exist. And so they built without permits. Nothing too extravagant – small kitchens to their semi-detached tents, cement floors – steps to make life in the extreme weather conditions more bearable. But it is this building that is the justification for destroying the village. A few hundred yards away, there is a second Susiya. This one is occupied by Jewish settlers and has been granted all the necessary permits. The contrast between the two is stark. The Jewish Susiya is neat rows of homes with red pointed roofs, the Palestinian one communal outhouses and worn tarpaulin. The dual system dates back to Israel’s occupation of the West Bank in the Arab-Israel war of 1967, but was altered by the 1995 Oslo II Accords, which were supposed to lead to lasting peace between Palestinians and Israelis. The agreement separated the West Bank into three parts – A, B, and C. Area A, including Ramallah, Bethlehem and other major Palestinian cities, is under control of the Palestinian Authority and Israeli civilians are technically forbidden from entry. Area B is under Palestinian governance but Israeli security control. And Area C, where Susiya falls, is under complete Israeli control, and administered by a branch of the Israeli Army called the Civil Administration in Judea and Samaria, part of the Coordination of Government Activities in the Territories (COGAT). A home in the Palestinian village of Susiya, in the West Bank. It is expected to be demolished in the coming weeks. The divisions were supposed to be interim, with part of Area C – now 60 percent of the West Bank – eventually to be given to the Palestinians. But the peace plan fell apart, and the situation of the two Susiyas highlights in bold the separate laws for Jews and Palestinians living in Area C.
Home to between 150,000 and 300,000 Palestinians, this segment of the West Bank is of particular interest to Israel’s right wingers, as it is the location of all of Israel’s 355,000 person strong settlements, deemed illegal by the United Nations. To live in accordance with Israeli law in Area C, both Israeli and Palestinian dwellings must have approved plans. The territory operates under a 1966 Jordanian planning law, but starting in 1971, the Israeli military issued a series of orders that eliminated local involvement for Palestinians in planning and set up “Special Planning Committees” for settlers, effectively establishing two systems – one for Palestinians, and one for Israelis. Naftali Bennett, leader of the right-wing Jewish Home party, has proposed that Israel annex Area C, where he approximates only 50,000 Palestinians make their homes. This would entail Israel claiming the entire territory and forcing the Palestinians to accept Israeli nationality and rule or leave. For Susiya, the result may be destruction, and not for the first time. The villagers were expelled in the 1980s – from the caves where they lived then – to make way for archaeological exploration of an ancient Jewish historical site. In the cave where Nawaja was born, visitors watch a video on the area’s Jewish past. Since then, they have been moved and seen their houses razed to the ground multiple times – some 70 demolition orders have been issued in total. With the help of several nonprofits, including an Israeli group called Rabbis for Human Rights, the village submitted a master plan to the civil administration authority, hoping to build on the lands they own. They were rejected, and the case is under appeal in the Supreme Court. Usually, pending such an appeal, an interim injunction order is issued to stop the demolition. But in late April, the judge – a settler – issued no such order. Even the demolition of structures deemed illegal is two-tier. According to government figures acquired by freedom of information requests by settlement researcher and activist Dror Etkes, historically the state has issued 14,782 demolition orders for Palestinian structures and 7,091 for Jewish ones. The authorities also raze Palestinian structures declared illegal at more than twice the rate of similarly adjudged Jewish structures, such as settlement outposts –14.2 percent of Palestinian structures with demolition orders are taken down, opposed to just 6.5 percent of Jewish structures. Several nongovernmental organisations have turned to the Supreme Court to challenge the Area C planning system itself. The cases are ongoing, but there isn’t a great deal of hope. In Susiya, villagers sleep in the solidarity centre at night in case the army comes. They have planted modest flower and herb gardens, a sign that they are in it for the long haul. Nawaja is frustrated but undeterred. In the legal battle, the state has proposed villagers move to an area that straddles Area A. But the Susiya villagers have no interest in leaving their land, and will continue to fight.